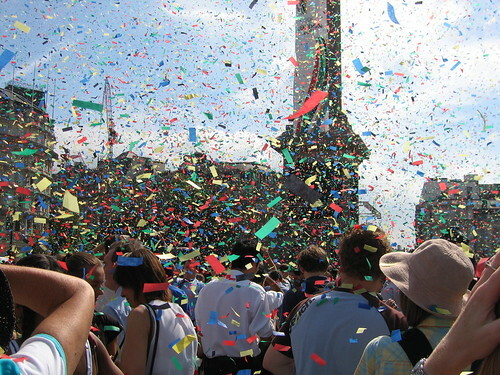 After the announcement that London had got the 2012 Olympics, a series of celebrations were planned. They never happened; we were bombed and things had to change. 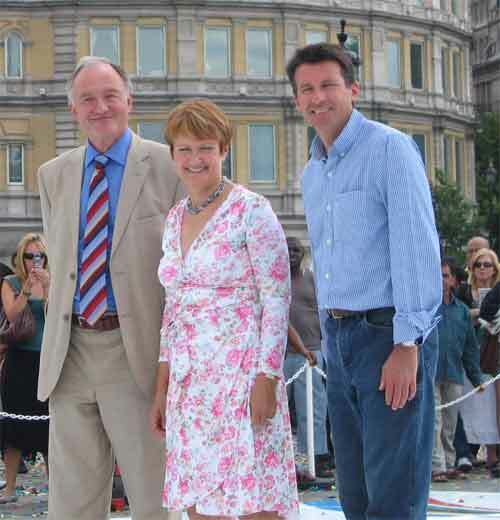 But today, there was a little get together in Trafalgar Square. Speeches by Ken Livingston, Tessa Jowell and Seb Coe were followed by Heather Small giving a live performance of Proud. The budget for bits of coloured paper had not been exhausted and bits were blown everywhere. After the song, there was the obligatory interviews and photocall. Here’s one of my efforts of the three speakers..
At the moment on the telly, there’s a Channel 4 programme about the London Bombings. But these are the bombs of 1974 and 1975, when the IRA exploded 40 bombs in a year, when the city felt under siege and bag checks and high security were constant. They were using grenades and machine guns as well. Nothing Changes, there’s always someone.